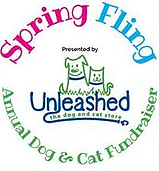 Carolina Poodle Rescue will be at the Spring Fling, presented by Unleashed – The Dog and Cat Store, in Raleigh, NC on Saturday, May 5, 2019 from 11am – 3pm. Stop by our information table at the NC State Fairgrounds to meet some of our adoptable pets, chat with our volunteers, and learn more about Carolina Poodle Rescue. The day is sure to have something for everyone: HUGE Doggie Easter Egg Hunt, with prizes of all size; Raffle: Enter to win a $100 gift certificate from Unleashed! 100% of the money goes to rescues/shelters; Scavenger Hunt: Visit the vendors to collect stickers for the FREE Scavenger Hunt. One winner will be chosen to receive a gift basket full of goodies from the vendors; Demos from Local Dog Trainers; Food Trucks, and More! !